Here is a sketch I did this past weekend while camping with my family. By some chance I actually had time to sketch twice (a miracle, believe me!). 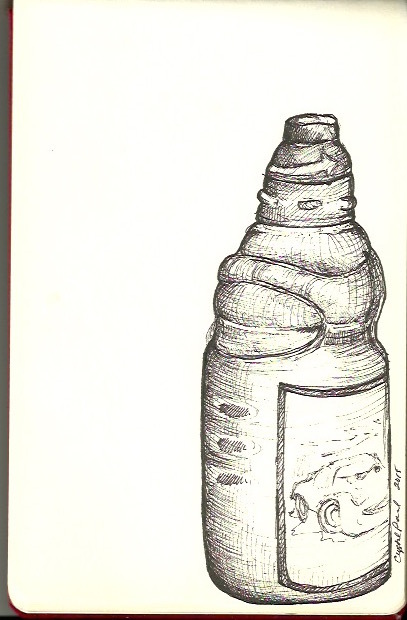 I enjoyed sketching this bottle, and would have liked to have completed the scene. The bottle was placed at the end of our picnic table among an identical bottle, and several other items (bug spray, sunscreen, etc). But, alas, time is short with twin three year old boys, so I stuck to the single bottle. This was drawn with a Micron 03 black ink in my Moleskin sketchbook, about 5×7, a little longer I think. Enjoy!